I have just returned from a two week stay in the North Island of New Zealand where there seemed to be a public awareness about sustainable fish and sustainable fishing and farming practices. 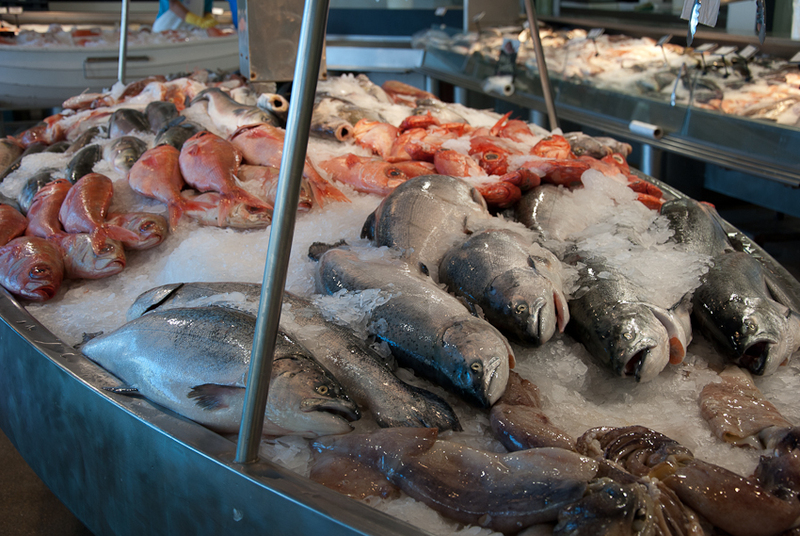 Seafood seemed plentiful and well priced and I found fish sellers that clearly state their support for sustainable fish species and how they only procure stocks from sustainable resources. There was even information on restaurant menus such as line caught snapper, or this fish was farmed in a sustainable way. 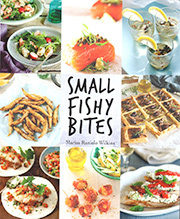 During my stay I ate many varieties of fish that I had not eaten before – I loved it all. Green lipped mussels (such as the ones in the photo from The Fish Market in Auckland) were around $3.50 per kilo; I did not spot any on restaurant menus, but maybe this is because they mussels are so common. While I was in New Zealand I stayed in serviced apartments (not that I did much cooking), and on one occasion I bought some and steamed them lightly (just enough to open them) and enjoyed them with some lemon juice. 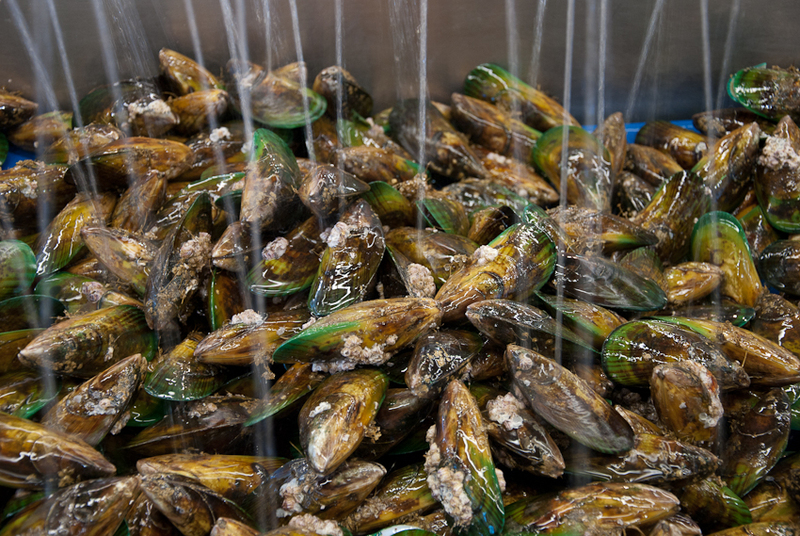 Green lipped mussel farming in New Zealand is sustainable; the government conducts research and careful monitoring into selective breeding, farming and harvesting methods. A good way to eat mussels (any type) is with rice. Saffron is used in Sicilian cooking and in this recipe, the rice is simmered in fish stock – the more traditional and older way to cook risotto in Sicily. Clean the mussels by rubbing them against each other in cold water(or use a plastic scourer). Pull the beards sharply towards the pointy end of the shell. Heat the oil in a large pan (which can be used to cook both the mussels and the rice), add the garlic and soften. Add the mussels and the parsley, toss them around in the hot pan, add a splash of wine, cover and cook until they open (about 4-6 minutes). Do not discard any mussels that don’t open – they just need more cooking. Remove the mussels from the saucepan. Take out half of the mussels from their shells – the mussels with their shells will be used for decoration on top of the rice. Add about 5 cups of the fish stock and saffron to the same pan and when it reaches boiling point add the rice. Bring to the boil, cover and simmer over moderate heat, stirring now and again to ensure that the rice does not stick and the stock has been absorbed. Taste the rice and season with salt if necessary. Add more stock or wine if needed – the rice is done when it’s al dente – just tender, but resistance can still be felt when you bite into it. (The rice will continue to soften). Stir into the rice the shelled mussels. Place the mussels with the shells on top of the hot rice or gently fold them through the top layer of the hot rice (Italians are never fussy about eating food which is not piping hot). Leave to rest for a few minutes for the flavours to meld before serving (the rice will also continue to cook and soften slightly). One of my recipes, Sarde a beccafico was selected as part of the food series My Family Feast and cooked by Sean Connolly (chef). You can see it making it online during the broadcast of the series. You cannot go to Sicily and not eat pasta con le sarde. There are many regional variations of pasta sauces made with sardines, all called by the same name, but the most famous is an ancient, traditional dish from Palermo. The pasta can be eaten hot or cold (at room temperature). I like the way Sicilians often skip between the sweet and savoury tastes – the sour and/or salty is often combined with the sweet and what makes this dish unique is the unusual combination of textures and strong fragrant tastes: the strong taste of the oily sardines, the cleansing flavour of the fennel, the sweetness of the raisins and the delicate aromatic taste of the pine nuts. Pasta con le sarde is presented with toasted breadcrumbs as a topping, in the same way that grated cheese is used. Originally the breadcrumbs may have been a substitute for cheese for the poor. In some versions of this dish the cooked ingredients are arranged in layers in a baking dish, topped with breadcrumbs and then baked – the breadcrumbs form a crust. Unfortunately we are not able to buy bunches of wild fennel (finucchiu sarvaggiu in Sicilian) in Australia, but we do have the wild fennel that grows in neglected areas such as on the side of the road, vacant land and along banks of waterways. In Sicily it can be bought in small bunches. In Australia you will recognise it by its strong aniseed smell and taste, strong green colour and fine fern like fronds. I collect the soft, young shoots of this plant, recognised by their lighter colour. This fennel is unlike the Florentine fennel and has no bulb. Because of its strong smell and taste, animals and insects tend not to eat it, so it can be prolific. I always ensure that the plant looks healthy before I collect it, after all it is a weed and it could have been sprayed. Fresh bulb fennel can replace the wild fennel, but the taste will not be as strong. If you are using bulb fennel try to buy bulbs with some of the green fronds still attached. I usually buy more than one fennel at a time and save the green fronds to use as a herb in cooking and I enhance the taste by using fennel seeds as well. The addition of almonds is a local variation and is optional – it brings another layer of taste and texture to the dish. If you choose not to use the almonds, use double the quantity of pine nuts (see recipe). The origins of pasta chi sardi (Sicilian) are said to be Arabic. 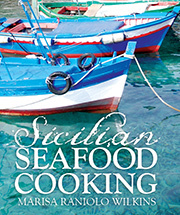 In one story, an Arab cook was instructed to prepare food for the Arab troops when they first landed in Sicily. The cook panicked when he was confronted by a large number of people to feed, so the troops were instructed to forage for food. He made do with what they presented – wild herbs (the fennel) and the fish (sardines) to which he added Arabic flavourings, the saffron, dried fruit and the nuts. I remember coming back to Australia and cooking this dish for friends after eating it in a restaurant in Palermo (Sicily) called L’ingrasciata (In Sicilian it means The dirty one! ), and how much all of my guests enjoyed it. I have continued to cook pasta con le sarde over the years, especially since sardines are plentiful, sustainable and now widely available in Australia. Pasta con le sarde is fairly substantial, and although in Sicily it would be presented as a first course (primo), in Australia I am happy to present it as a main (secondo) and I use greater quantities of fish. I follow the pasta course with a green salad as a separate course, but I never serve pasta and salad together. Part of me remains Italian to the core – in Italy a salad is a contorno (a side dish) and an accompaniment to a main course. Pasta, risotto and soup – which are all primi, cannot be accompanied by a side dish. Traditionally the sauce is made with sardines that are butterflied (i.e. remove the backbone), or as the Italians say, aperti come un libro (opened like a book). I buy fillets to save time. The wild fennel is put into cold, salted water (to give maximum flavour to the water) and boiled for 10-15 minutes (it can be left in the water for longer). The green tinged, fennel-flavoured water will be used to cook the pasta – it will flavour and colour the pasta. The boiled fennel is added as an ingredient in the sauce. Reserve some wild fennel to use in the cooking the fish. If using the bulb fennel, wash and cut the bulb fennel into quarters but reserve the green fronds to use raw in the cooking the fish. Add fennel seeds and boil until tender. Drain the cooked fennel in colander, and then gently squeeze out the water. Discard the seeds and keep the fennel-flavoured water to cook the pasta. Chop the fennel roughly, this will be added to the sauce later. Cut about two thirds of the sardine fillets into thick pieces. The whole fillets go on top and are used to provide visual impact. Heat oil in shallow wide pan, suitable for making the pasta sauce and to include the pasta once it is cooked. Sauté the onions over medium heat until golden. Add pine nuts, raisins and almonds (optional). Toss gently. Add the sliced sardines, salt and pepper and the uncooked fennel. Cook on gentle heat for about 5-10 minutes, stirring gently. Add the cooked chopped fennel and the saffron dissolved in a little warm water and continue to stir and cook gently. Boil bucatini in the fennel water until al dente. Fry the whole fillets of sardines in a separate frying pan, keeping them intact. Remove them from the pan and put aside. At this stage the pasta can be assembled and presented, or baked. Place the pasta into the saucepan in which you have cooked the fish sauce. Leave the pasta in the saucepan for 5-10 minutes to incorporate the flavours and to preserve some warmth. Gently fold in the whole sardines. When ready to serve, tip the pasta and fish mixture into a serving bowl, arranging the whole fillets or butterflied sardines on top and dress the whole dish with the toasted breadcrumbs. Oil a baking tray or an ovenproof dish and sprinkle with toasted breadcrumbs to prevent sticking (it is not necessary that they be browned in oil, just browned in the oven). Place a layer of pasta on the breadcrumbs, top with some of the fish sauce and some whole fillets of sardines. Form another layer and ensure that some of the whole fillets are kept for the top. Cover with fresh breadcrumbs and sprinkle with extra virgin olive oil and bake in preheated 200C oven for approximately 10 minutes. A teaspoon of sugar can also be sprinkled on top of the breadcrumbs – this, with the oil will help the bread form a crust, adding yet another contrasting taste and a different texture. Summer is the time for BBQs and grilled fish with a simple dressing of extra virgin olive oil, parsley cut finely (do not use a food chopper – it will taste grassy), lemon juice and seasoning. But sometimes, a different dressing can make it more special and will bring more compliments when you present the fish to guests. There are no set weights and measures for making sauces – the measures are purely my estimation of the ratio or balance of ingredients and flavours. Sarsa saracina (Sicilian) Salsa saracina (Saracen sauce). It is a cooked sauce and has that particular set of ingredients which are so common to Sicilian cooking – olives, pine nuts (or almonds) and seedless sultanas. The sauce contains sugar and saffron – Saracen ingredients particularly popular in foods from the north-western side of Palermo. saffron, 2 good pinches (it will depend on the potency and quality of your saffron – you need to be able to taste it and see some yellow tinge). Heat the oil in a pan and add anchovies and stir to dissolve. Add the olives and the other ingredients and stir to amalgamate the flavours. Add the saffron mixed in a little warm water and heat through.